Need a kick in the pants when it comes to your career? Time to look inward and make some improvements? Check. We’ve got you covered. Thinking about selling….anything, but maybe even real estate? Check. We’ve also got YOU covered. Need a healthy spoonful of laughs (and a surprise or two) in our headlines? We’ve got that covered too. 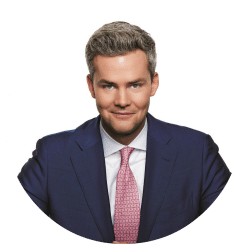 Coming down to the basement to share the sometimes painful but always poignant story about how he went from zero to million dollar listings… we welcome Million Dollar Listing reality television star and author of Sell It Like Serhant, Ryan Serhant. It took Ryan years to discover what his competitive advantage was… and he’s going to share it with you today. But that’s not all. In our headlines segment, we’ll discuss a new checking account with features that look and smell a lot like those offered by credit card companies. Is this the future? Should you switch banks? We’ll discuss. Plus, we’ll share a story about a bride who might have asked her guests for a touch more than they were prepared to give. Of course, we’ll also throw out the Haven Life line, answer a letter from the mailbag, and to celebrate tonight’s award show, share some of Doug’s Emmy-related trivia. Thanks to Emperor Investments for supporting Stacking Benjamins. Go to emperorinvests.com/sb and select “Stacking Benjamins podcast” when asked how you heard about the show. Thanks to Emperor Investments for supporting Stacking Benjamins. Go to emperorinvestments.com/sb and select Stacking Benamins podcast. Which TV show currently holds the title for most Primetime Emmy Awards by a television program? Ethan doesn’t have a kid yet, but is about to get married and is thinking about opening a 529 plan. For now, they would just fund it with cash rewards from Fidelity. Thoughts? Sarah wants to know the best strategies on building up an emergency fund while still being able to qualify for FASFA.